PLANET GS-4210-48P4S is a cost-optimized, high-density PoE+ Managed Gigabit Ethernet Switch featuring PLANET intelligent PoE functions to improve the availability of critical business applications. It provides IPv6/IPv4 dual stack management and built-in L2/L4 Gigabit switching engine along with 48 10/100/1000BASE-T ports featuring 36-watt 802.3at PoE+ and 4 additional Gigabit SFP slots. With a total power budget of up to 440 watts for different kinds of PoE applications, it provides a quick, safe and cost-effective Power over Ethernet network solution for small businesses and enterprises. Under the trend of energy saving worldwide and contributing to environmental protection, the GS-4210-48P4S can effectively control the power supply besides its capability of giving high watts power. The “PoE schedule” function helps you to enable or disable PoE power feeding for each PoE port during specified time intervals and it is a powerful function to help SMBs or enterprises save power and money. It also increases security by powering off PDs that should not be in use during non-business hours. The GS-4210-48P4S can be configured to monitor connected PD (Powered Device) status in real time via ping action. Once the PD stops working and responding, the GS-4210-48P4S will resume the PoE port power and bring the PD back to work. It will greatly enhance the network reliability through the PoE port resetting the PD’s power source and reducing administrator management burden. The GS-4210-48P4S allows each of the connected PoE IP cameras or PoE wireless access points to reboot at a specific time each week. Therefore, it will reduce the chance of IP camera or AP crash resulting from buffer overflow. The GS-4210-48P4S features a low noise design and an effective ventilation system. It supports the smart fan technology that automatically controls the speed of the built-in fan to reduce noise and maintain the temperature of the PoE switch for optimal power output capability. The GS-4210-48P4S is able to operate reliably, stably and quietly in any environment without affecting its performance. Supporting both IPv6 and IPv4 protocols, the GS-4210-48P4S helps the SMBs to step in the IPv6 era with the lowest investment as its network facilities need not be replaced or overhauled if the IPv6 network is set up. 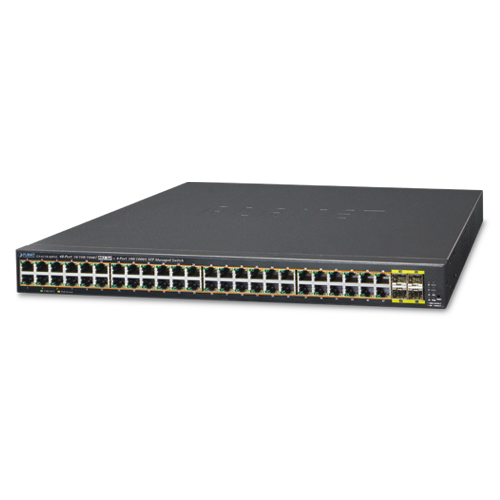 The GS-4210-48P4S can be programmed for advanced switch management functions such as dynamic port link aggregation, 802.1Q VLAN and Q-in-Q VLAN, Multiple Spanning Tree protocol (MSTP), loop and BPDU guard, IGMP snooping, and MLD snooping. Via the link aggregation, the GS-4210-48P4S allows the operation of a high-speed trunk to combine with multiple ports, and supports fail-over as well. Also, the Link Layer Discovery Protocol (LLDP) is the Layer 2 protocol included to help discover basic information about neighboring devices on the local broadcast domain. The GS-4210-48P4S is loaded with robust QoS features and powerful traffic management to enhance services to business-class data, voice, and video solutions. The functionality includes broadcast/multicast storm control, per port bandwidth control, IP DSCP QoS priority and remarking. It guarantees the best performance for VoIP and video stream transmission, and empowers the enterprises to take full advantage of the limited network resources. PLANET GS-4210-48P4S offers comprehensive IPv4/IPv6 Layer 2 to Layer 4 Access Control List (ACL) for enforcing security to the edge. It can be used to restrict network access by denying packets based on source and destination IP address, TCP/UDP ports or defined typical network applications. Its protection mechanism also comprises 802.1X port-based user and device authentication, which can be deployed with RADIUS to ensure the port level security and block illegal users. With the protected port function, communication between edge ports can be prevented to guarantee user privacy. Furthermore, port security function allows to limit the number of network devices on a given port. The GS-4210-48P4S also provides DHCP snooping, IP source guard and dynamic ARP inspection functions to prevent IP snooping from attack and discard ARP packets with invalid MAC address. The network administrators can now construct highly-secure corporate networks with considerably less time and effort than before. For efficient management, the GS-4210-48P4S is equipped with web, Telnet and SNMP management interfaces. With the built-in web-based management interface, the GS-4210-48P4S offers an easy-to-use, platform-independent management and configuration facility. By supporting the standard SNMP, the switch can be managed via any standard management software. For text-based management, the switch can be accessed via Telnet. Moreover, the GS-4210-48P4S offers secure remote management by supporting SSH, SSL and SNMP v3 connections which encrypt the packet content at each session. The four mini-GBIC slots built in the GS-4210-48P4S support SFP auto-detection and dual speed as it features 100BASE-FX and 1000BASE-SX/LX SFP (Small Form-factor Pluggable) fiber transceivers to uplink to backbone switch and monitoring center in long distance. The distance can be extended from 550 meters to 2 kilometers (multi-mode fiber) and up to 10/20/30/40/50/70/120 kilometers (single-mode fiber or WDM fiber). They are well suited for applications within the enterprise data centers and distributions. The GS-4210-48P4S supports SFP-DDM (Digital Diagnostic Monitor) function that can easily monitor real-time parameters of the SFP for network administrator, such as optical output power, optical input power, temperature, laser bias current and transceiver supply voltage. 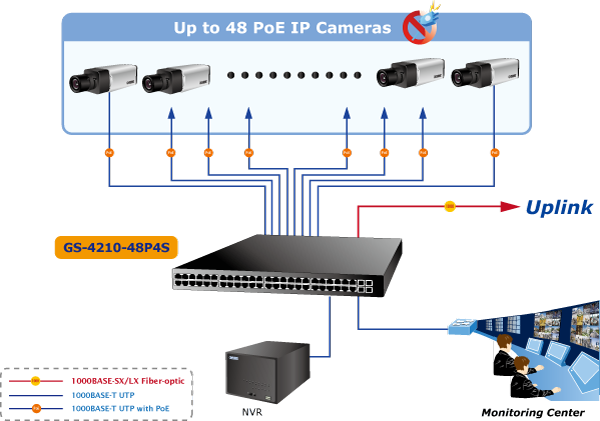 Providing up to 48 PoE+, in-line power interfaces and 4 100/1000BASE-X SFP interfaces, the GS-4210-48P4S can easily build an IP camera system where power can be centrally controlled. 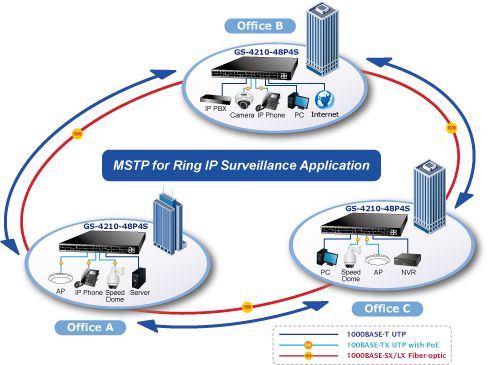 The GS-4210-48P4S can work with 8/16/32-channel NVR and surveillance software to perform comprehensive security monitoring. For instance, one GS-4210-48P4S can be combined with one 32-channel NVR and one 8-channel NVR, which feature real-time video and audio, live viewing, and playback. 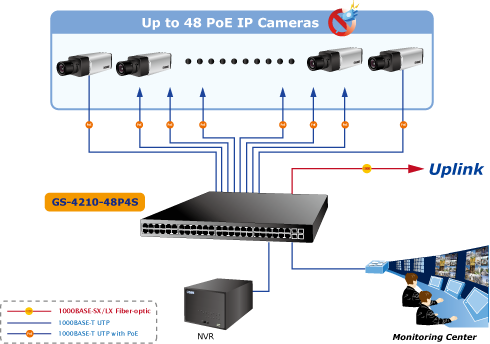 Each of its PoE ports can be linked with a PoE IP camera in order for the administrators to centrally and efficiently manage the surveillance system in one site. Moreover, its 4 100/1000BASE-X SFP interfaces also provide flexible fiber connection for uplink to public server groups. The GS-4210-48P4S features strong, rapid self-recovery capability to prevent interruptions and external intrusions. It incorporates Multiple Spanning Tree Protocol (802.1s MSTP) into customer’s automation network to enhance system reliability and uptime.Applying the IEEE 802.3at Power over Ethernet standard, the GS-4210-48P4S can directly connect with any IEEE 802.3at end-nodes like PTZ (Pan, Tilt & Zoom) network cameras and speed dome cameras. 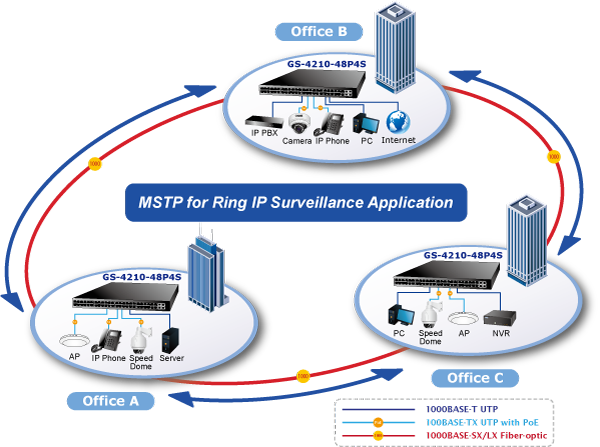 The GS-4210-48P4S can easily help enterprises build a network infrastructure of wireless AP, IP camera and VoIP systems where power can be centrally-controlled.